Red Stripe beer didn’t have the deep pockets of the myriad global brands that spent millions in Super Bowl marketing. But it was able to take advantage of an opportunity unwittingly handed to it by one of those global brands, auto manufacturer Volkswagen. Volkswagen kicked off its Super Bowl XLVII marketing by releasing its game-day commercial six days prior to the event. The spot, which featured a white Minnesotan speaking in a Jamaican patois to try to cheer up his coworkers, ignited a racially charged debate that quickly spread across mainstream and social media. As a Jamaican company, Red Stripe decided to jump into the conversation. In less than six days, the company and agency Colangelo created lighthearted video spots featuring Red Stripe “referees” making a call on the Volkswagen controversy, which it would run online throughout the game. The day before the game, Red Stripe sponsored tweets and Facebook posts to promote the videos as well as hijacked trending hashtags. 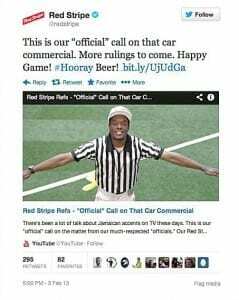 On Super Bowl Sunday, during the first half of the game, Red Stripe commented on in-game events and commercials, leveraging the advertisers’ hashtags, while teasing the upcoming ruling of its refs on the Volkswagen spot that started it all. During halftime, Red Stripe unveiled the promoted video post on Facebook and Twitter. The ruling: “Not-offensive. Happiness is always in play. Hooray commercial.” During the second half of the game, Red Stripe followed up with posts featuring its refs and social responsibility messaging. The last-minute campaign garnered 7.3 million impressions and 103,000 views on YouTube. It also increased Red Stripe’s number of Facebook likes by 5% and its number of Twitter followers by nearly 24%. And it wasn’t only Red Stripe’s target market of young urban males who approved of the promotion: Twitter’s president of global revenue praised Red Stripe at South by Southwest later that year for creating one of the Super Bowl’s best social media moments and for its use of news hijacking.